The California Family Code governs an order of permanent spousal support, mandating that courts consider a host of circumstances outlined in the statute. A couple’s marital standard of living is just one factor a court will look at when determining the amount of spousal support to order in a divorce case. Other pertinent factors include the supporting spouse’s ability to pay, the health and age of the parties, the duration of the marriage, the balance of hardships to the parties, and the ultimate goal that the supported party will be self-supporting within a reasonable period of time. To protect your rights concerning spousal support in divorce, you are encouraged to contact an experienced San Diego family law attorney as early in the proceedings as possible. In an recent blog post, we discussed a contentious divorce case involving a couple arguing over the amount of child and spousal support to be awarded to the wife. In that post, we covered the arguments regarding child support. Here, we will discuss the court’s treatment of the request for spousal support. The couple had been married for 20 years when they decided to separate. Throughout their marriage, the husband received cash gifts or loans from his parents’ and grandmother’s trusts. The cash advances included annual tax-free gifts of $26,000 to the husband, wife, and each of their three children. The husband also received an annual distribution of $13,000 from his grandmother’s estate. On occasion, the husband’s father also gave the couple large sums of money to buy real estate and other property. Interestingly enough, neither spouse had a job with a steady income. According to the wife’s testimony, everybody in the family gets money when they need it. When the parties separated, their monthly expenses were approximately $45,000. Soon after the separation, the husband got a job earning an annual income of $60,000, and he also continued to receive the yearly gifts of $26,000 and $13,000 from his parents’ and grandmother’s trusts, respectively. During the divorce proceedings, the wife sought spousal support in the amount of $28,782. She claimed that the husband had approximately $60,000 in monthly cash flow available for spousal and child support. The trial court, however, ordered the husband to pay only $2,000 per month in spousal support based on the husband’s then-annual income of $99,000. The wife appealed, arguing that the $2,000 monthly was inadequate because it would require her to live below the marital standard of living. The court of appeals upheld the trial court’s decision to base the spousal support order on the husband’s ability to pay, rather than that of his parents. The court emphasized that the parents were no longer advancing funds to the couple, so there was no continuing stream of income. Under California case law, the marital standard of living is not an absolute measure of reasonable need, but instead it is a “basis” or reference point for calculating need and support. The court must consider all of the relevant statutory factors in order to determine an amount that would achieve a fair and reasonable result under the circumstances. And that amount may in fact be greater than, equal to, or less than what the supported spouse may need to maintain the marital standard of living. As this case illustrates, calculating spousal support can become complicated depending on the facts of each case. In order to protect your financial rights in divorce, it is important to contact a local family law attorney with experience handling such cases. 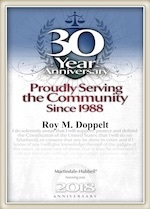 oy M. Doppelt has been representing parties in divorce matters for more than 20 years. Doppelt and Forney, APLC serves clients throughout Southern California, including San Diego, Encinitas, La Jolla, and Chula Vista. For a free consultation, contact Doppelt and Forney, APLC through our website, or give us a call toll-free at (800) ROY IS IT (769-4748).